Introducing a new feature: Shootaround. Today's Shootaround brings you inside the film sessions of the Sixers and Bucks to prepare you for tonight's matchup. Bill Sharman started the shootaround, a light, game-day morning practice, in the 1960s as a way to get players up and moving and burn off nervous energy. When his Lakers won the championship in 1972, the concept caught on and spread throughout the NBA — it’s always been a copycat league. As time passed, the shootaround morphed into a great way to to go over strategies and opponent plays and prepare teams for their opponents that night. In the modern NBA, one aware of load management and emphasizing player rest, not every team has shootarounds, and most teams don’t hold one for every game. Instead, they’ve boiled it down to its essence: showing film to players on their opponent and walking through some important concepts on the court. Depending on the day, they might get in shooting and some other quick court work, but that’s really not the point of the shootaround anymore. Shootaround is part of my mission to end the days of sports media talking down to fans, and instead focus on teaching them up. My goal is for you, the fan, to be able to watch the game through a completely different lens after reading Cleaning the Glass. And I’d bet that’s exactly what will happen after you read Shootaround. 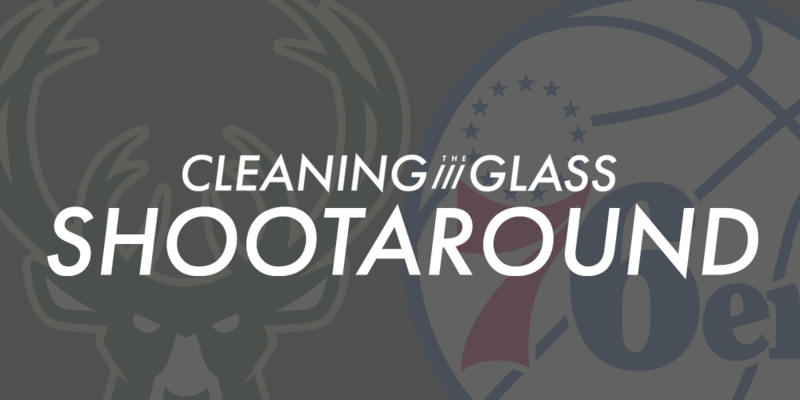 Today’s Shootaround features the Sixers-Bucks matchup. You can watch the game at 8 PM EST tonight on ESPN. Should they lose, however, and the Wizards or Heat (or both) win tonight, it changes all of this. Milwaukee would be subject to coin flips to determine whether or not they keep their pick, and they do not own the tiebreaker in any scenario with Washington or Miami, meaning they’d drop to the 7th or even the 8th seed. The Wizards play the Magic tonight, and Orlando has a very strong incentive to lose for draft pick reasons; the Heat, meanwhile, play the Raptors in Miami, and Toronto has nothing left to play for in the regular season. It’s not crazy to think that if the Bucks lose they’ll slide all the way to 8th and have a rematch of last year’s first-round series with Toronto. With so much on the line and the game on ESPN, it figures to be a great matchup to debut Shootaround. Read the strategic breakdown, and watch the game tonight in a way you never would have otherwise. And now, without further ado, let’s bring you inside the locker rooms for our shootaround film sessions. Steve is a former Assistant Coach with the Brooklyn Nets and Video Coordinator with the Memphis Grizzlies. He played basketball at UNLV. You can find his breakdowns, video and lukewarm takes on Twitter @stevejones20. Take Care of the Ball. This is not a team you can afford to turn the ball over against. They have toned down the defense in certain areas but make no mistake this is still very much a team that thrives off turnovers. Pre-rotation, weakside gambles, steals. Live ball turnovers are tough, allows them to get out and run and get layups. Quick Decisions. Milwaukee struggles when teams make quick decisions and attack their defense. May take some patience but the ball has to move, players have to move. Holding the ball just allows them to load and set up. This is a team that you know is going to be in rotation, if you can get them into scramble mode and attack their closeouts you can get great looks for shooters. Ball Movement and Attack. Ball movement is key but sustaining offense is big as well. Getting to second/third options, playing outside of the play. If you can avoid being predictable on offense this is a defense that will react. You will see activity, physical play, switching, and if they smell weakness they will continue to attack. Transition Defense / Force Them Into a Half Court Game. This is a team that is going to push the ball off turnovers and long misses. Versatility allows for multiple ball handlers to attack in transition. Important we get back and stop the ball, show bodies to Giannis/Bledsoe/Middleton in transition. No easy baskets, force them to earn it in the half court. Taking away the highlight plays is one thing but you still have to be ready to defend. A lot of random action, a lot of random drives since driving ability is their strength. Force them to run offense, force them to execute, which is not their strength. Just know that outside of the set, you’re going to have to accept the challenge of guarding these guys in 1v1 situations. Protect the Paint. Big lay up team, big paint attack team. Protecting the paint is going to be huge. Again this is a team with guys who put a lot of pressure on defenses with their ability to attack off the dribble. No middle drives. Have to be ready to help the helper on drives, especially if you are guarding a non-shooter. It’s going to take multiple efforts. 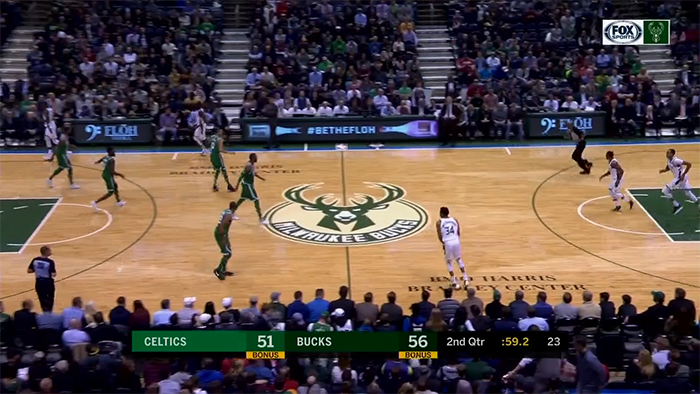 No reason to allow Middleton, Giannis, Bledsoe, Parker to live in the paint on drives. Bigs have to be ready to defend in pick-and-roll. Their bigs are good at screening and rolling and their offense opens things up. Limit to One Shot. Finishing the stop is key against this team. Allows you to get out and run without them being able to load or set their defense. Also could get them stagnant. We can’t let their bigs have an impact by tipping the ball out and giving them open threes. They have a lot of athleticism and size, have to box out and attack on other end. Switch all pick-and-roll and handoffs except with point guards and centers. Want to keep PGs out of mismatches with Giannis/Parker/Middleton and don’t want centers on an island for isolations to start. But could switch all players at some point. Pick and roll with center: go under, big contain in paint. If Bledsoe or a PG sets a ball screen for Middleton/Parker/Giannis: show and under. If we switch a small, double on post ups. Let’s go to the film. In this first clip, Middleton pushes. Watch how Boston has all 5 back which is what you have to do to defend this team. The next stage is continuing to guard. Taking away the initial layup is great. 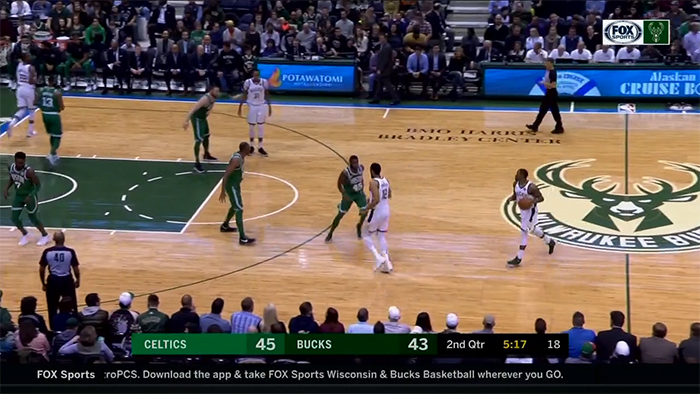 Random action between Middleton/Giannis then a handoff to Bledsoe. The ball gets in the hands of their talent and if you let down it’s a layup. Brown tries to stay on top to keep him on the side but you see the importance of bigs in P&R: Baynes is there but Bledsoe gets by him. You’ll see a lot of these types of possessions from Milwaukee where they are just playing. Looking for an early attack but will move it. Bigs looking to set random ball screens. On any pass to the corner they like the action of cutting into a pick and roll. Have to have the awareness to continue to guard them. Here’s the Bucks’ Hawk set. They used this a lot more when Brogdon/Dellavedova were in the lineup but still effective for them to get an easy basket. 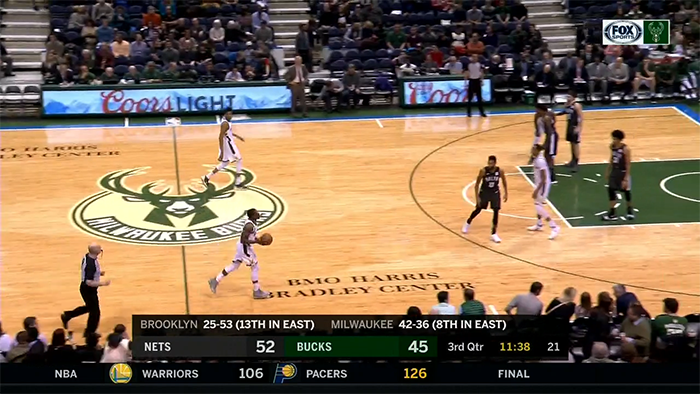 These are the type of baskets you have to avoid giving Milwaukee: easy, quick, unearned hoops. The key is watch the weakside as Snell and Middleton are lifted to take away corner help. Using Giannis as a passer also helps avoid a deflection. Here’s Milwaukee’s Push set. 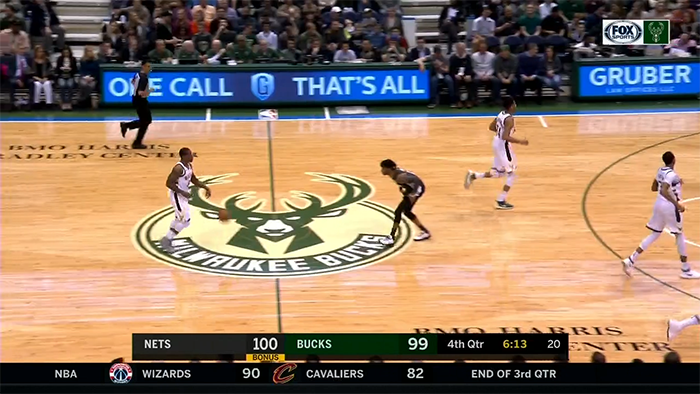 Strong defense and denials by the Nets but Middleton gets his handoff, Allen is nowhere near the level and Middleton gets free reign to get in the paint and get a shot off. Another Push set. Elbow split between Parker and Giannis. Nets do a good job of guarding the initial action. 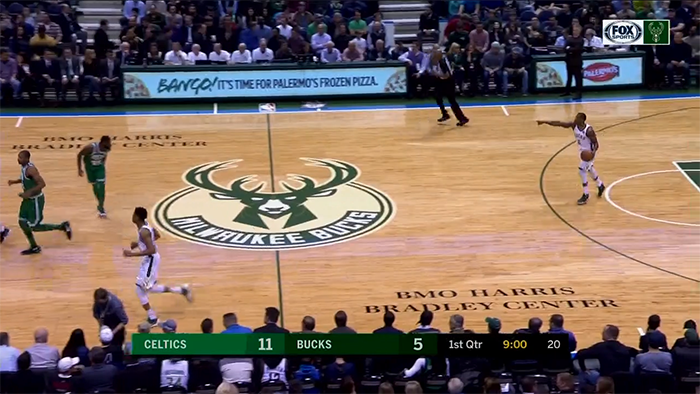 You can see not a ton of pace on the handoff between Zeller and Giannis. 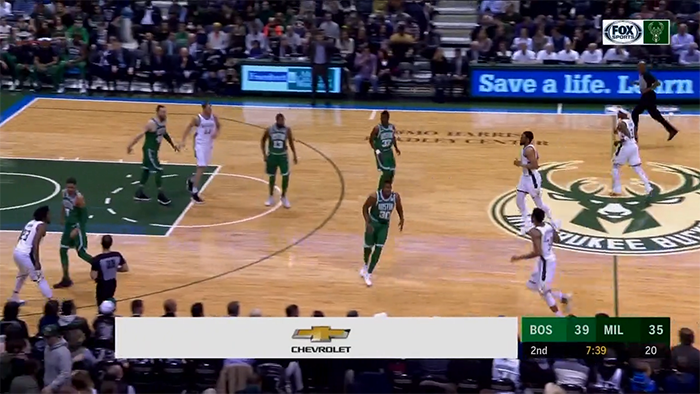 But this is the tough part about it, look at the angle/placement of the pick and roll Zeller sets. It’s tough to get a coverage there, Giannis is able to get in the paint and poor communication/defense ends up with a layup. This is Push Inside, a wrinkle out of the Push set. Will run for multiple players but love it for Parker. Hit him and right into a pick and roll. You can see the pressure they put on Boston by being able to turn the corner. When they get in the paint they are dangerous. They have the size to make plays by finishing or hitting their bigs late. 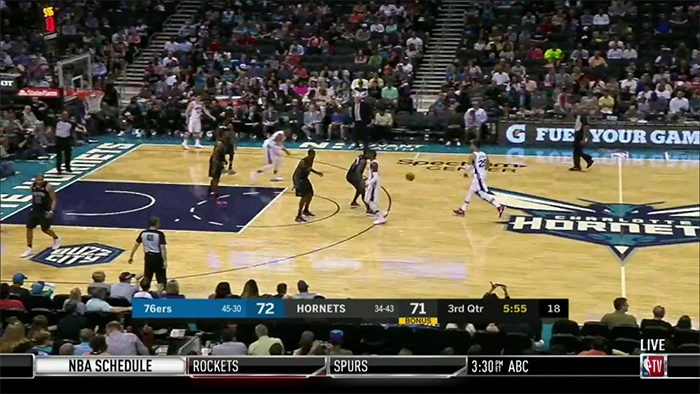 Henson, Zeller, rollers why it’s important for weakside to also be involved. Another from Push Inside. Went back to it again and Henson able to slip and use Boston using 2 bigs against them by slipping. Pick and roll defense key vs. the Bucks, the weakside is not there to help. Can’t give this team layups. Milwaukee uses Horns action as a great way to get Bledsoe and Giannis in action at the same time in pick and roll. Brooklyn was going under so it’s also a good way to get Giannis the ball at the top of the key. 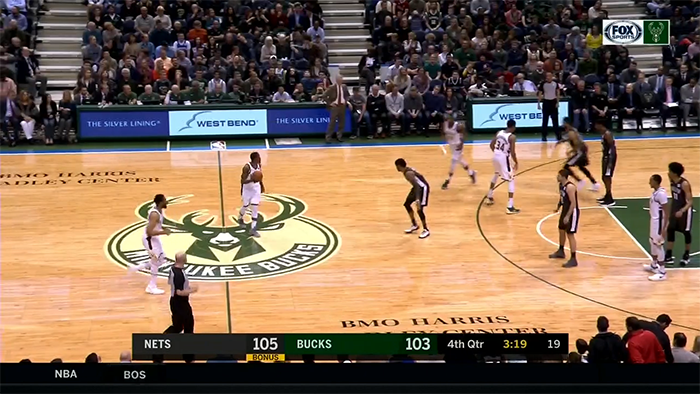 The key here is watch how Brooklyn loads on the iso, recovers to Bledsoe and shows help on his drive. Bledsoe scores but those are the type of efforts you have to make defensively. 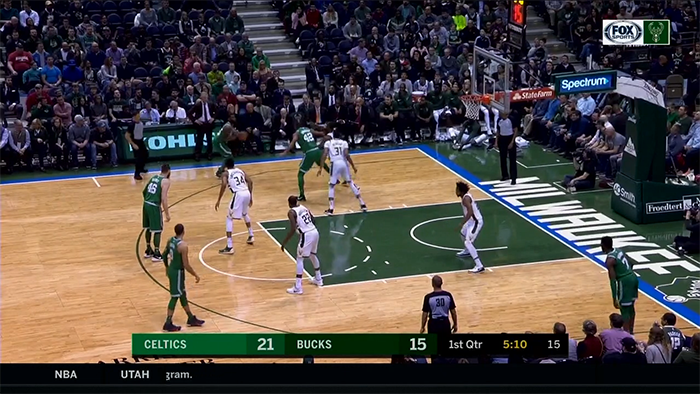 Bucks love to go to Chin action (back screen into pick-and-roll) for Middleton. If your bigs are playing back he obviously has the ability to pull up but can get into the lane for little runners and floaters like this. Defensively you can’t give him this kind of space to dictate. Again, Chin action for Middleton and Crabbe does a better job of fighting but this is part of the challenge of facing the Bucks: their talent and confidence in taking tough shots. You have to live with some of these makes but you have to force them to take shots like these. Small-Small Ball-Screens. Use our 1s, 2s, and 3s to screen for Giannis to get mismatches. 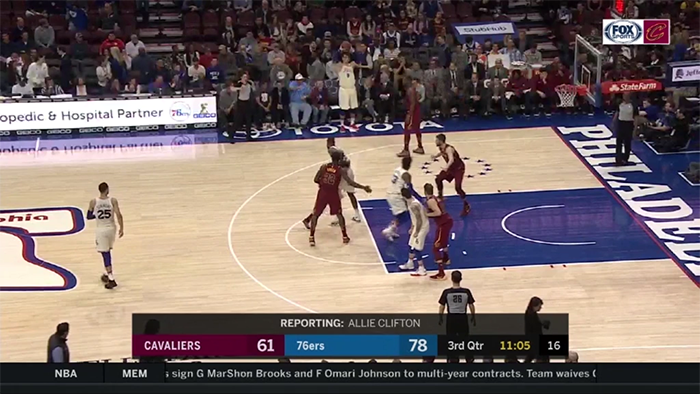 Force Philadelphia to show on these ball-screens or switch into a mismatch with their smaller guards (Redick, Belinelli, McConnell). Avoid 4-5 or 3-5 ball-screens where they can credibly switch and force us into minimal advantage isolations. Don’t get into a track meet. Philadelphia is one of the fastest teams in the league and thrives in transition. Take our opportunities when they’re available, but let’s dictate the pace of this game and make it a half-court battle. Paint Touches. No Joel Embiid means they lack their usual rim protection. Don’t settle for early pull-ups. Get deep post position, kick and re-post if necessary. Re-screen in pick-and-roll until we wedge them back to the free throw line. Patience for the paint will also feed into our pace control. No long outlets in transition. 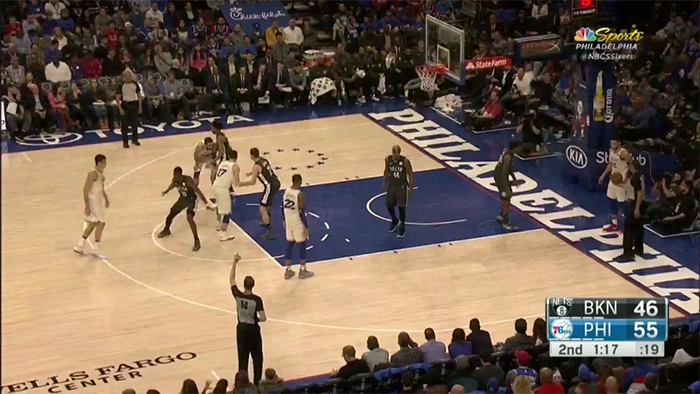 Simmons loves to advance the ball with the pass to get the ball up court quickly. Find the string between ball and man and be able to touch it. 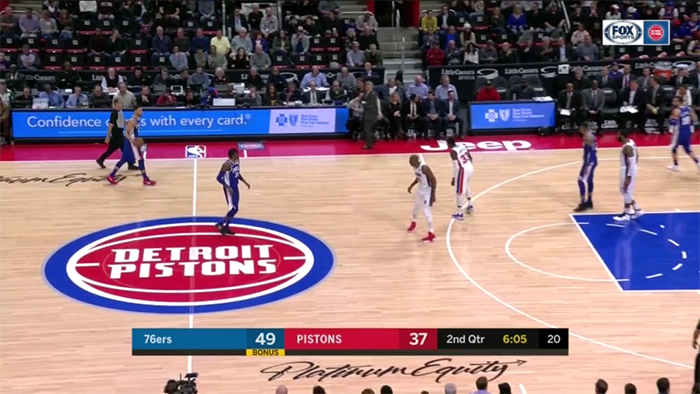 Greet wing lane runners above the three-point line—alert to early catch-and-shoot 3s from Covington, Belinelli, and Redick. Be ready to contest and drive them inside the arc. Make Simmons a scorer. Simmons is the lone team playmaker with Embiid out. Minimal help on isolations and post-ups—switch almost every pick-and-roll. Do not over-help and create passing lanes. No easy elbow catches. Much of their offense is initiated off the elbows, and they make a point of catching inside the three-point line. No easy elbow catches to push handoffs well above the three point line. Do not let Redick and Belinelli come off with their toes right above the line. Simmons/Fultz/McConnell and center = Under. Stay tight to screener, and do not let him roll or pop cleanly. If we can, get up into his body and drive him into the ball-handler at the point of the screen. Redick/Belinelli/Covington = lock-and-trail. No open catch-and-shoot 3s. Heavy pressure on the catch. Make them hit the roller and we’ll rotate out. Make everyone a passing playmaker. On these we want to lock-and-trail the staggered screens, go over on strong-side handoffs if it’s a shooter (Redick, Belinelli, Covington). The big stays high and forces immediate pocket pass on catch. Elbow is similar. They look for a pin down into a handoff. We want to lock-and-trail both pin downs and go over/under (“let me through”) handoffs based on personnel. 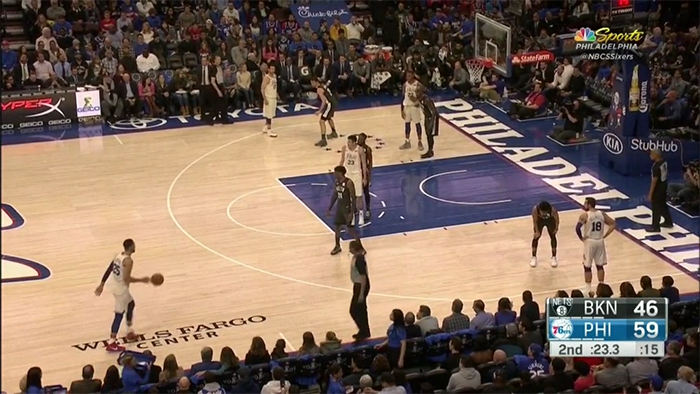 Here the Sixers screen for Simmons to the post and then set off ball screens. We don’t want to switch on the rip/slice (back screen). Sag to protect, leave center momentarily open. 1 on 1 post defense, minimal help. Force Simmons to baseline side away from potential passes. Lock-and-trail weak-side screens. Alert for curl/pop action, where shooter curls and screens for top screener. In this set, the Sixers run a 1-2 pick-and-roll (shooting guard screening for point guard). We want to switch the initial ball-screen and then try to trap the handoff, corralling right at the break. Force the shooter to attempt a pocket pass. No immediate pull-up on the catch. This is a standard Floppy set, with two shooters screening for each other and then running off a screen on either side. We want to lock-and-trail both shooters. Stay tight to the body, remain attached. Switch if you get disconnected. Alert for twist action, one shooter curling around other before popping out. Stay attached, get low and skinny to bust through. A standard side out of bounds set for them. The ball handler always comes off the shooter’s screen, not the big man’s. We’ll switch the 1-2 screen, then go overtop the flare. 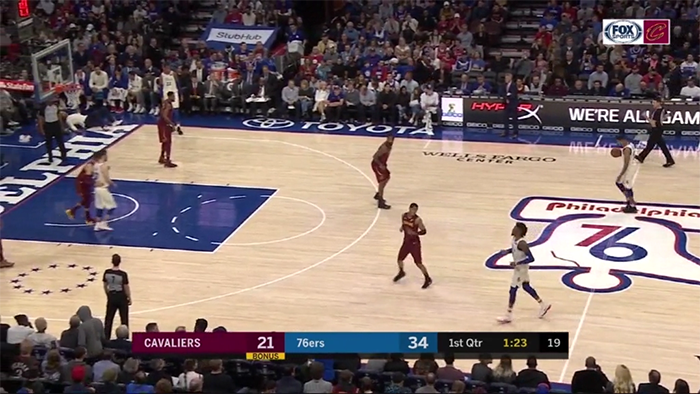 Simmons inbounds and then a shooter screens for him into the post. Don’t let Simmons get in front after the inbounds. Face guard on top of baseline. Make him fight to get in front for post position. Force the catch close to free throw line. This set is hard to guard because of the Sixers’ shooters screening for each other. We want to lock-and-trail, stay on middle side to keep ball in corner.